Another friend is getting married. We girls decided to send her off in style. I booked a gorgeous Lebanese restaurant. Arabian Nights meets upmarket eaterie, this place promised superb food, glamorous environment and belly dancing in one weekday evening. We slipped into high heels post work and wafted down the rose-scented, mosaic staircase. Took our low seats and went straight for the olives. Staring at the beautifully-laid table, there seemed only one place for the pips to go. I emptied them into a little ceramic bowl filled with white and brown paper egging my friends on to follow suit. Chewing gum and tomato tips went in. Then the waiter arrived to inform us that we were using the salt and pepper bowl as an ashtray. As I crawled home from overeating at the end of the evening, I wondered how I was going to balance the excesses of the night with a suitable Indian recipe. 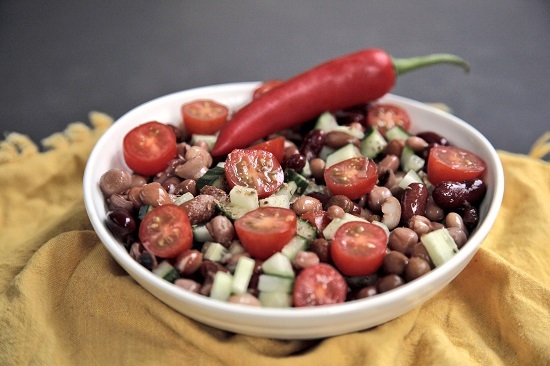 I remembered mother’s Indian mixed bean salad recipe – a delicious, spiced summery treat. Toss it up, eat it with the fish fillets and recover from your embarrassing moments. Rinse, drain and leave the beans to dry in a colander. In the meantime, chop the cucumber and onion (if using) into small pieces, and halve the tomatoes placing them in a mixing bowl. Stir the beans into the vegetables, adding a bit of salt. Now, warm the cumin seeds on medium in a little egg pan for ten seconds and then crush finely in a pestle and mortar. Next, carefully drain off any excess water in the salad. Squeeze the lemon juice all over, stirring through the ground roasted cumin and carom seeds. Add salt to taste to finish. Let the spices work their magic for at least half an hour before you serve. yeah i know how that feels. and even i have a list of after-hogging-less-guilty recipes. mostly have steamed bananas or idlis the next day, though i hate idlis!! Look pretty simple to make and very colourful! Lovely sallad, with a gorgeous flavour combo! I make this often, only, I add capsicum and tomato, leave out the cucumber – it’s a mid-afternoon snack for us at the office! What else can I say, YummmooO! enjoyed readin ur posts,..salad looksyum,.. I know how you feel Namesake . On days like this I eat bhindi and roti !BTW I ‘ve made that deadly Hyderabadi baingan today – ooh yummy . Oh that salad is just what I need. The bros are visiting and we’ve been eating out everyday outside. A salad and khichdi would be good! I miss good Arabic food. I grew up in the Mid-East so all the ‘Mediterranean’ restaurants around here annoys me to no end. Lebanese baked goods are phenomenal. A world of happiness to your friend! Yum – it looks so fresh! Would be good with some tinned tuna for a quick lunch too. I’ve never had ajwain seeds though, will have to seek them out. I love bean salads like this! So perfect and really filling! Awesome! It’s a great pleasure to visit here, I found delicious dishes here and I would like to visit again here, If anyone wants more information about fruit salad and healthy salad, then visit us once.